Cleaning the exterior of your mobile home is the single best thing you can do to keep your property looking new and well-kept. The job does not require hiring a cleaning service or using expensive power tools. With a few basic tools and household materials, the task is a simple do-it-yourself endeavor. Vinyl siding is easy to clean with just a few items. Use a garden hose to soak a 4-foot wide section of the home's exterior. This prepares the area for cleaning. Dip the deck brush in the mop bucket and scrub the soaked area. For stubborn stains, hold the brush as close to the head as possible and press firmly. Use the step stool to get closer to higher sections near the roof. Use the hose to rinse the scrubbed area. You should notice a difference immediately between the cleaned area and the rest of the home. 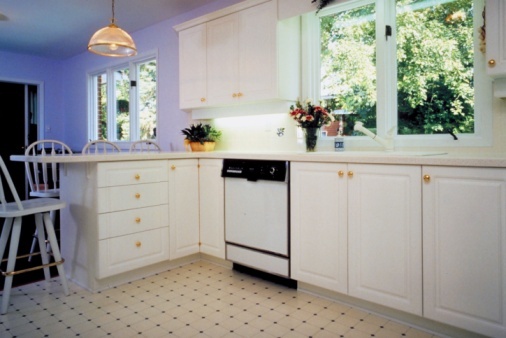 If stains remain on the cleaned section, repeat the process, focusing only on the stained areas. Add a basic cleaner to the vinegar cleaning solution, if necessary. Move to the next 4-foot section and repeat from Step 2 until all of the siding is clean. 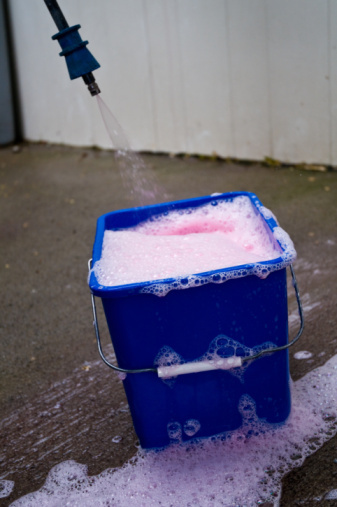 Refill the mop bucket as needed with more of the vinegar and water solution.